I recently turned 45. Even more recently, I turned 62. This old body is starting to show signs of wear and tear. I haven’t checked, but I’m pretty sure it’s way out of warranty. When I was a teenager, I thought anyone in their sixties was ancient. But now that I’m one of those people, I realize that as a naive 17-year-old, I was … 100% correct. If you’re one of those youthful people still in your teens, twenties, thirties or even forties, don’t feel sorry for me. I’ve discovered many advantages to getting old. For example, at my age, I’ve stopped worrying about what other people think of my appearance. It’s so liberating. Sure, my body will never regain the six-pack abs I never had in my youth. And yes, my waistline is not quite as svelte as it once wasn’t. That’s okay. That’s the great thing about getting to this point in life: you can look back and finally accept that most of your hopes and dreams have passed you by. Nobody expects you to do any great new thing in your next chapter – because there is no next chapter. So, you can kick back and read the latest John Grisham novel – on the couch – in your boxers – scarfing down peanut butter from the jar. Another benefit of aging is that I no longer worry about all the embarrassing things I did the previous day – because I usually can’t remember doing them. My recall skills have declined a bit in recent years. For example, last weekend, for the life of me, I couldn’t remember the name of that gifted group who sang Let It Be and Hey Jude. Then hours later, BAM, it hit me: Of course! The Grateful Dead. At 62, my daily workout regimen is more laid back compared to 40 years ago – starting with the fact that “daily” is no longer part of my workout vocabulary. When I was younger, I ran six-miles five times a week. I regularly did weights or aerobics for an hour plus. Since nobody cares what I look like anymore, I’ve taken my foot off the gas pedal slightly. Now, aerobics consists of how quickly I can change the channel from ESPN1 to ESPN2 and back again. I still try to get in a solid 30 minutes on the stationary bike every other day – and on a good day, I’ll spend more than half that time actually pedaling. In the past few years, I’ve added an entirely new workout routine: 20-second wind sprints to the bathroom two or three times a night. I wear my Fitbit to bed so I can log these nighttime steps. Oh sure, being 62 has some drawbacks – like chronically stiff joints, elevated blood pressure, degenerating eyesight, and reduced bone density – apparently, that’s a thing. Admittedly, some activities of my youth are more challenging now, like triathlons, snowboarding, and standing upright, but these are relatively small trade-offs. On the positive side, I can still play tennis, golf, and racquetball. I just do them really badly – and I can no longer remember the score. Another difference in life at this stage is my relationship with pills. 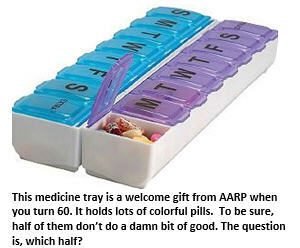 When I was 35, the only pill I took was a multi-vitamin. (The grape-flavored Flintstones chewables were my favorite.) But nowadays I take a battery of medications intended to regulate my cholesterol, prevent heart attacks, improve my eyesight, soothe my creaky bones, protect my prostate, and one that I can no longer remember what it’s for, but I’m guessing it might be to improve memory. I have no idea whether these pharmaceuticals are doing any good at all. But they’ve gotten me out of a lot of housework: “Oh, honey, I would gladly mow the lawn like you asked, but I just took my morning tablets and I’m not supposed to exert myself for at least four hours.” To be honest, none of my meds have this restriction. I just show my wife a random bottle and invite her to read the warning label. Her eyesight is as bad as mine, so she just takes my word. Being young, spry and full of energy has obvious advantages over the downward spiral I now find myself in. Nevertheless, when you get to my age, I’d argue that the plusses outweigh the negatives. But if you’re 22, or 32, or even 42, and you disagree, feel free to call me any time to state your case. Just don’t call between 8 and 10am Mondays or Wednesdays, because I’ll be playing racquetball or between 9 and 11am on Fridays as I’m at tennis. Or Thursdays between 7:30 and noon because that’s my golf day. Oh, and avoid calling between 2 and 3 any afternoon, because I’ll be napping in my hammock. 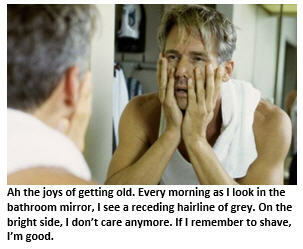 Ah, the pleasures of getting older. Now that I’m 55, I have the urge to go apologize to the 55 year olds I looked down on when I was 20. I love your “age math.” By your calcualtions I recently turned 15.